Former President George Bush hugs Reds shortstop Barry Larkin after throwing out the first pitch at Great American Ball Park prior to their opening game with the Pittsburgh Pirates in March 2003. The Reds were playing their first game in the new park. That's the attraction Reds' Opening Day has had for well over a century, and it will be the same on Thursday. Find a nice spot Thursday morning on the Findlay Market Parade Route – 100th edition of same – and count the number of local politicians you see riding by in souped-up cars, antique wagons and even on foot, smiling and waving to a crowd of thousands who will, for once, put aside their political feelings and smile and wave right back. This is no day for political fights in the street. Now, some of those politicos you see will be genuine Reds fans, knowledgeable about the game; the kind you will run into at Great American Ball Park once the hoopla and excitement of Opening Day has worn off. Ten-game winning streak; 10-game losing streak – it's all the same. They know baseball is a game that evens out in the end. Even though sometimes it takes a while. There are others who pretend for a day, dress up in Cincinnati Red, and parade down the street and go to the ball park to see and be seen. Most politicians I meet know how much I love baseball, so they try to start a conversation on the subject. With most of them, the conversation falls apart very quickly when it becomes apparent how little they really know about the game. Others genuinely love the game and talk about it at length. Our new governor, Mike DeWine, is among those. For many years, DeWine has shared a ticket package with some of his Greene County friends, both at Riverfront Stadium and Great American Ball Park. The seats happen to be in my section, and when DeWine is at the game, he usually stops by our row to talk baseball for a while. Both of Ohio's U.S. Senators, Republican Rob Portman, is, of course, a Reds fan. Sherrod Brown is a life-long fan of the Cleveland Indians. I don't think I've ever had a conversation with Brown that did not begin or end with baseball. 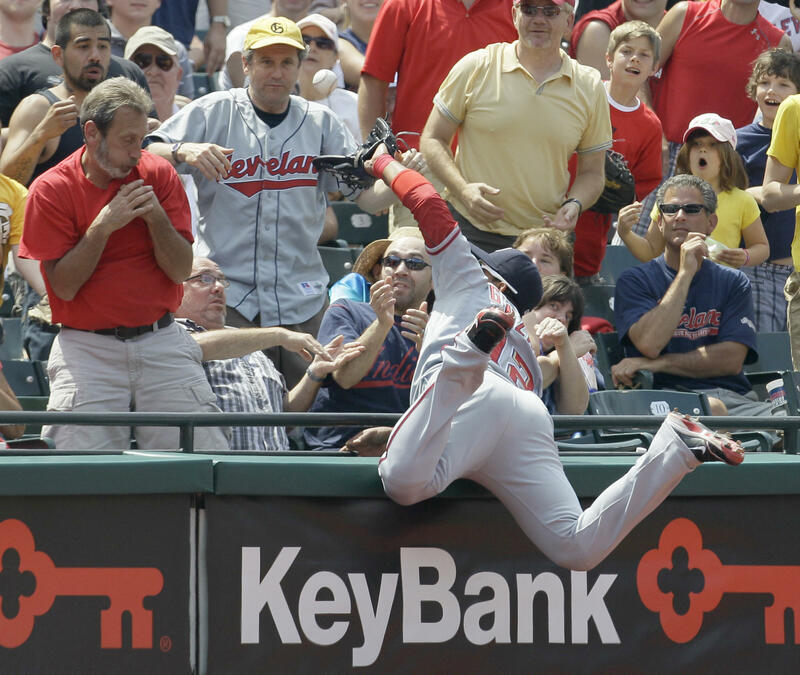 Sen. Sherrod Brown, in a Cleveland Indians baseball jersey, watches as Washington Nationals third baseman Alberto Gonzalez tries to catch a pop foul by Cleveland Indians batter Russell Branyon in the sixth inning of a June 2010 game in Cleveland. Of the recent presidents, you would have to put George W. Bush in the category of true baseball fans. Before he was elected Texas governor, he headed the ownership group of the Texas Rangers. And Bush 43 is the only sitting president to throw out a ceremonial first pitch at a Reds' Opening Day, on April 3, 2006. The Reds were playing the Cubs that day and Bush toured both clubhouses before the game. In the Reds clubhouse, relief pitcher Kent Mercker pulled a Bush-Cheney hat out of his locker to show the president; and Ken Griffey Jr. gave him one of his bats. Bush 43's father, President George H.W. Bush, loved the game too. He was a star first baseman as a young man at Yale. The elder Bush, a left-hander, tossed a ceremonial first pitch at the first Opening Day game at brand-new Great American Ball Park in 2003. But Bush 43 was the first sitting president to throw out a ceremonial first pitch at Reds Opening Day. Some might think that Cincinnati's own William Howard Taft – a good amateur ballplayer in his hometown as a young man – would have had that honor, but Taft never threw out a first pitch at any Reds game. Taft was the first president to throw out a ceremonial first pitch – on April 14, 1910 at a game between the Washington Senators and the Philadelphia Athletics. Bush would have been beaten by 25 years had it not been for a horrible tragedy that took place eight days before Reds Opening Day in 1981. President Ronald Reagan had been scheduled to toss out the first pitch, but, on March 30, he was shot and seriously wounded outside a Washington hotel. Right before the game started, the voice of public address announcer Paul Sommerkamp came out over the Riverfront Stadium speakers. "There can really be no appropriate relief pitcher for the president of the United States and we have decided it is most appropriate in 1981 to have no ceremonial first pitch,'' Sommerkamp said. A moment of silence followed. Then, Tom Seaver of the Reds took the mound and the game was on. The craziest Opening Day ceremonial first pitch didn't come from a president, a vice president, or even a governor. It came on April 2, 2007, and the joke was on Cincinnati Mayor Mark Mallory. Before a full house at Great American Ball Park, Mallory uncorked a crazy, wild throw that went sideways, bewildering Reds Hall of Famer Eric Davis, who was standing near the Reds dugout and was nearly hit by the pitch. It made a 2015 list in Time magazine's online edition on the 10 worst ceremonial first pitches ever. Mallory made the list, along with 50 Cent, Mariah Carey and Monique Evans, Miss Texas. Thursday, Eric Davis is scheduled to throw out this year's ceremonial first pitch. If I were him, I'd ask for Mark Mallory as my catcher. This year marks the 150th anniversary of the Cincinnati Reds and the 100th anniversary of the Findlay Market Opening Day parade, making both events particularly special for Cincinnati's unofficial holiday this March 28. Whether or not you plan to attend, knowing what roads will be closed due to the parade and where parking will be restricted for the game will ensure your day is a home run. Editor's note: This story was originally published March 25, 2014. We are re-posting it here in honor of the Reds' Opening Day on March 28, 2019, as the story is as much a fan favorite as the pastime of baseball itself.